Microgaming invites all of its players to enjoy a one of a kind wild adventure as they go on a trip into the wild where they can come across many animals such as the vicious wolf, the Silver Fang as well as other animals. In order for players to enjoy such adventure, they will have to place a bet and then spin the reels of the game. These stakes are placed at the control panel at the bottom of the screen. Players will have the ability to pick the number of lines that they want to place their stakes on, the value of the used slot coins as well as the number of coins. 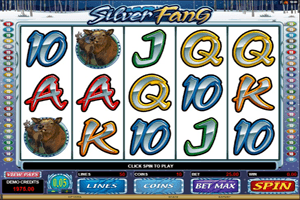 Play Silver Fang Slot here. Players will click on spin and they will watch the wild life themed symbols start to spin on the reels of the games and the 50 lines that the game offers. These symbols include a deer, a wolf, a wolf’s foot prints, the logo of the game, a howling wolf and poker card symbols. The Howling Wolf symbol is wild, which means that it can replace any of the other symbols on the reels of the game. There is also the Scatter moon symbol, which can reward players in scattered rewards and it can also trigger the free spins round that gives players up to 15 free spins with a multiplier. The game also comes with a gamble feature that enables players to play a game of luck with their winnings, they can keep playing the gamble game until they collect the winnings or lose.